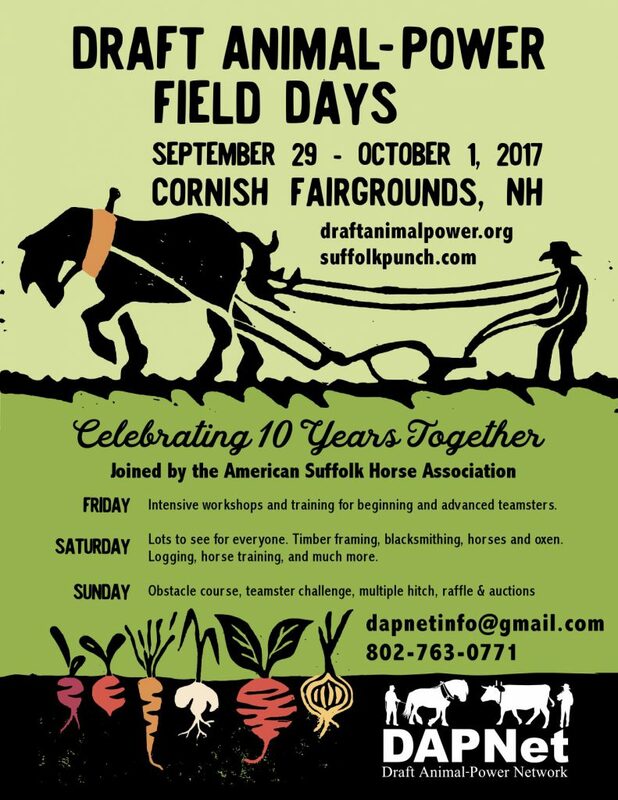 The Draft Animal-Power Network are running 3 days of events at the Cornish Fairgrounds NH from September 29th – October 1st. The Draft Animal-Power Network aims to advance the use of draft animals, to promote sustainable land stewardship and to build vibrant communities through year-round educational and networking opportunities that highlight the ongoing efforts of people throughout the region. The weekends events will begin on Friday, September 29th, with 3 intensive all day workshops which will give participants the opportunity to spend an entire day learning with hands on experience from experienced teamsters. The topics for the workshops include ‘Cultivation and Tillage with Draft Animals’, ‘Growing Your Draft Animal Power Farm’ and ‘Forest to Frame’. Friday evening will end with a square dance with the Bob Boynton Square Dance Band. On Saturday and Sunday, there will be more half day workshops, round-table discussions, music by the bonfire, obstacle courses and teamster challenges and much more! There are also 20 weekend scholarship places for young teamsters, to apply, email dapnetinfo@gmail.com explaining why you are interested in attending asap! the 12th annual blackfly ball is this weekend!